This was a dull picture with blown up skies, askew and no size enough to properly crop, but yet it was a beautiful Catalan Art Nouveau (Modernisme) balcony I thought you might like to set eyes on. There are images I shoot so badly that it becomes really hard to use them afterwards. I tried to pretend a soft color, almost black and white with some grain but not on the stained glass windows. Both the balcony and the windows are a little emphasized with some light. I hope you appreciate the architecture in the end which is the main purpose of a wasted hour of image processing. 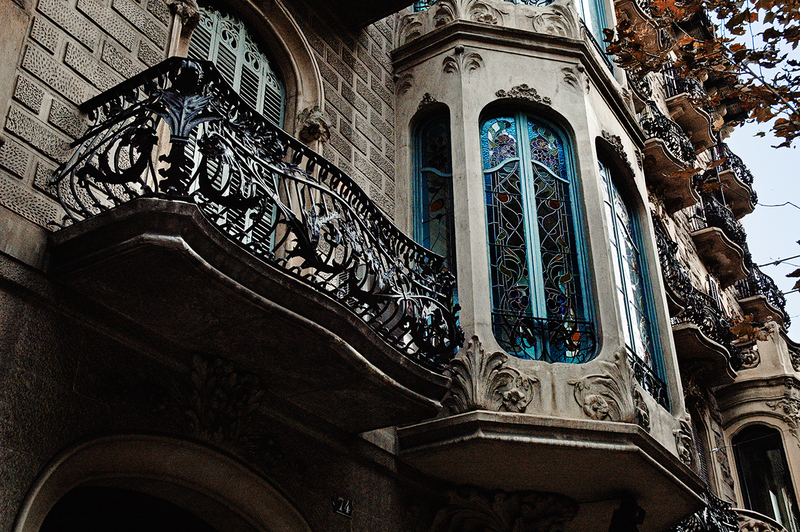 Forged iron balconies, one of the fabulous artistic skills lost in Barcelona. Pois se posso comentar em português, assim será. É uma varanda muito peculiar, num Art Noveau muito impressivo. É uma sorte viver numa cidade que dispõe de exemplares destes assim bem preservados. The end result was worth your effort ... very nice! I like this balcony very much. The architecture is just beautiful. I noticed when we were there that some developers are renovating certain areas of the city. Are they trying to keep the old architectural integrity? Lo siento que no he escrito mucho. . . Las clases empezaron, y tengo mucho trabajo. Pero! Visito cada dia!